In January 1950, President Truman made the controversial decision to continue and intensify research and production of thermonuclear weapons. At the time, David Lilienthal, chairman of the Atomic Energy Commission, had strong reservations about pursuing the "Super" or thermonuclear bomb. Nonetheless, on July 25, 1950, President Harry Truman wrote to Crawford H. Greenewalt, President of E.I. du Pont de Nemours and Company, asking DuPont to undertake the design, construction and operation of a new site to produce plutonium and tritium, a necessary ingredient for the thermonuclear bomb. Because of the increasing range of Soviet aircraft, the Commission ruled out expanding Hanford but preferred distant sites in the South and Ohio River region. Thus began the vast expansion of the nuclear weapons complex that eventually had operations in some thirty-two states. In addition to the research and development of fission weapons during the Manhattan Project, theoretical work on the hydrogen bomb had also begun. In the early 20th century it was recognized that stars probably obtained their enormous output of energy from some sort of nuclear process. During the 1930s, Hans Bethe investigated this phenomenon and suggested that the sun and other stars derived their energy from a set of thermonuclear reactions that took place under enormously high pressures and temperatures believed to prevail in the center of the stars. However, many believed that these conditions were impossible to recreate on earth and, as a result, few scientists had given much thought to producing such reactions in a laboratory. The advent of the atomic bomb dramatically altered the prospects for producing a hydrogen bomb. At the center of an exploding fission bomb, temperatures exceeding 100,000,000 degrees are produced, and so it was realized that at least one of the conditions necessary for igniting a thermonuclear reaction was possible. In 1942, after creating the first nuclear chain reaction on earth at the Met Lab in Chicago, Enrico Fermi supposed that the fission process that occurred within an atomic bomb could be used to ignite the same sort of thermonuclear reaction that took place inside the center of the sun. He speculated that reactions involving deuterons, the nuclei of the naturally occurring heavy form of hydrogen, would react explosively together under the enormous temperatures created during an atomic explosion and would produce helium and huge amounts of energy. When Los Alamos was established, the exploration of the hydrogen bomb was among the original objectives. However, because the development of fission bombs turned out to be more difficult than expected, their development required and received the full attention of the Laboratory. Nonetheless, a small group of theoretical physicists under the direction of Edward Teller made a substantial effort to explore the prospects of a thermonuclear bomb during the war. In the spring of 1946, the physicists who had remained at Los Alamos after the war had ended once again took up the study of how thermonuclear reactions might be produced on earth. The research soon branched out into two distinct lines. One such line explored the comparatively simple objective of igniting a relatively small mass of thermonuclear fuel by means of the energy produced in a relatively large fission explosion--what would later become known as "boosting" or the "booster principle". The other line of research had the much more difficult task of igniting a relatively large mass of thermonuclear fuel by means of a relatively small fission explosion. A report on the status of physicists' understanding of the thermonuclear process as of spring 1946 was published in June of that year and was titled "Report of Conference on the Super". Among those who attended the conference were Manhattan Project scientists Edward Teller, John Von Neumann and Stanislaw Ulam. Also in attendance was Dr. Emil Klaus Fuchs who, as it was later learned, was passing on what he knew about atomic research to the Soviet Union. The report judged that the theoretical design submitted to the conference was on the whole "workable" and that the development of a hydrogen bomb was in fact feasible. However, the report also concluded that considerable resources would be needed to develop the Super Bomb and there was no estimates of how much the project would cost or how long it would take to succeed. Work on the "Super" progressed slowly from 1946 to 1949, mainly because scientists working on the project still could not determine how to investigate the thermonuclear reaction process in bulk in the laboratory. In fact, the only way to study and test the fusion process in even a small mass of fuel was to subject it to the extreme heat and enormous energy output of a full scale nuclear explosion. These types of experiments proved both difficult and expensive. As a result, most physicists at Los Alamos devoted their time to improving and increasing the efficiency and yield of fission bombs, which were much easier to test on a laboratory scale. When the White House publicly announced that the Soviet Union had indeed exploded their own atomic weapon (known as JOE-1) on September 23, 1949, discussions surrounding the proposal to build the superbomb immediately intensified. The Soviet nuclear test shocked the world. Many of the top physicists who had worked on the Manhattan Project believed that it would be at least five years before the Soviets could build their own atomic bomb. Both Harry Truman and Major General Leslie Groves had estimated that it would take several decades for the Russians to test a nuclear device. The Soviet nuclear test in August 1949, coupled with the "fall" of China to Communism later that year, struck fear in many Americans. The perceived balance of power that had existed between the Western countries and the Communist Bloc since World War II seemed to have radically shifted in the Communists' favor. All of this raised a very serious pair of questions: What should the American response be, and how should the United States go about achieving it? Some, including Edward Teller, E.O. Lawrence, and Luis Alvarez, believed that building the hydrogen bomb was the best way to counter the new Soviet threat and reclaim the advantage in the nuclear arms race. Others, including Robert Oppenheimer, James B. Conant, and David E. Lilienthal, believed that the hydrogen bomb was a weapon of mass genocide (even more so than the atomic bomb) and its development would ultimately threaten the future of the human race. The debate over whether or not to build the super would be played out in the last months of 1949 and Truman's decision in January 1950 would drastically alter the course of the Cold War. As the debate over whether or not to build the hydrogen bomb heated up, the Atomic Energy Commission decided to convene a special meeting of its General Advisory Committee (GAC) to be held as soon as possible. The GAC had been established by the Atomic Energy Act of 1946 with the objective of managing the postwar development of nuclear energy and technology in the United States. The Committee, which was chaired by Robert Oppenheimer, included many of the top-level physicists and technological leaders who had participated in major wartime projects. Other prominent members included James B. Conant, Lee A. DuBridge, Enrico Fermi, I.I. Rabi, Hartley Rowe, Glenn T. Seaborg, Cyril Stanley Smith, and Hood Washington. The committee, which met on October 29-30, 1949, was asked to share its view on the hydrogen bomb and to consider the whether the Atomic Energy Commission was doing enough in its objectives of common defense and security. The GAC published its report, which included three separate sections, on October 30, 1949. The report was almost entirely declassified in 1974. Part I of the report dealt mainly with all pertinent questions other than those directly involving the hydrogen bomb. This included a recommendation to expand facilities for separating uranium isotopes and for producing plutonium and also increasing the supplies of uranium ore needed to produce nuclear weapons. Part I also urged the continued development of fission bombs, particularly those which could be made available for "tactical delivery." Part II of the report discussed the hydrogen bomb. In addition to outlining what was known about the super and expanding on the difficulties its development presented, the GAC concluded that the hydrogen bomb could probably be built. The report noted that, "A final point that needs to be stressed is that many tests may be required before a workable model has been evolved or before it has been established beyond reasonable doubt that no such model can be evolved. Although we are not able to give a specific probability rating for any given model, we believe that an imaginative and concerted attack on the problem has a better than even chance of producing the weapon within five years." Part II of the report also discussed the implications of developing such a powerful weapon and emphasized that virtually no limits existed regarding the explosive power of thermonuclear weapons: "it is clear that the use of this weapon would bring about the destruction of innumerable human lives; it is not a weapon which can be used exclusively for the destruction of material installations of military or semi-military purposes. Its use therefore carries much further than the atomic bomb itself the policy of exterminating civilian populations." Part III of the report got to the heart of the matter: the question of whether the hydrogen bomb should be developed. The report ultimately concluded that a program to build the super should not be pursued: "Although the members of the Advisory Committee are not unanimous in their proposals as to what should be done with regard to the super bomb, there are certain elements of unanimity among us. We all hope that by one means or another, the development of these weapons can be avoided. We are all reluctant to see the United States take the initiative in precipitating this development. We are all agreed that it would be wrong at the present moment to commit ourselves to an all out effort towards its development." With the debate over the hydrogen bomb at a fever pitch, President Truman turned to a special subcommittee of the National Security Council (NSC) for advice. The committee included AEC Chairman David E. Lilienthal, Secretary of Defense Louis Johnson, and Secretary of State Dean Acheson. When the committee first met to discuss the hydrogen bomb on November 30, 1949, Lilienthal not only supported the conclusions of the GAC not to build the super but also urged that one last attempt be made to achieve an international agreement on nuclear energy with the Soviet Union. Johnson and Acheson both supported development of the hydrogen bomb. When the committee met for its final time on January 31, 1950, Lilienthal had realized that stopping the development of the super was impossible. He accepted a draft set of recommendations for the President, written by Dean Acheson, to proceed with the development of the hydrogen bomb. On February 24, 1950 the Joint Chiefs of Staff requested the president to approve all-out development of hydrogen bombs and the means for their production and delivery. After seeking advice from the Special Committee of the NSC, Truman approved the request on March 10. Construction of the reactors for producing tritium thought to be necessary for thermonuclear fuel commenced soon after. Two and a half years later on November 1, 1952, the United States tested its first ever thermonuclear device at Eniwetok Atoll in the South Pacific. The Mike Shot, as it was known, yielded 10 megatons of TNT and was roughly 1000 times larger than the bomb dropped on Hiroshima seven years earlier. Less than a year later, the Soviets exploded their first thermonuclear weapon. By 1953, the nuclear arms race was on. Operation Greenhouse was a series of nuclear tests conducted at Enewetak Atoll in early 1951 to test various design principles that would later become pivotal in the development of thermonuclear weapons. The purpose of these tests was to reduce the size, weight, and amount of fissile material necessary for nuclear weapons, while simultaneously increasing their destructive power. The most important test during the Greenhouse series came on May 8-9, 1951, when physicists tested a device in which a relatively large fission yield was to be used to ignite a relatively small mass of thermonuclear fuel. This classical design operated on the radiation-implosion principle that had been explored earlier in 1946. The purpose of the experiment, nicknamed the "George" shot, was to demonstrate, as a minimum, that a thermonuclear reaction could under ideal conditions be made to take place in an experimental device. The test worked, and the largest fission explosion to date succeeded in igniting the first small thermonuclear flame ever to burn on earth. According to Edward Teller, the success of the "George" shot was pivotal in the development of the Super and provided scientists with the confidence to proceed along further speculations of thermonuclear design principles. 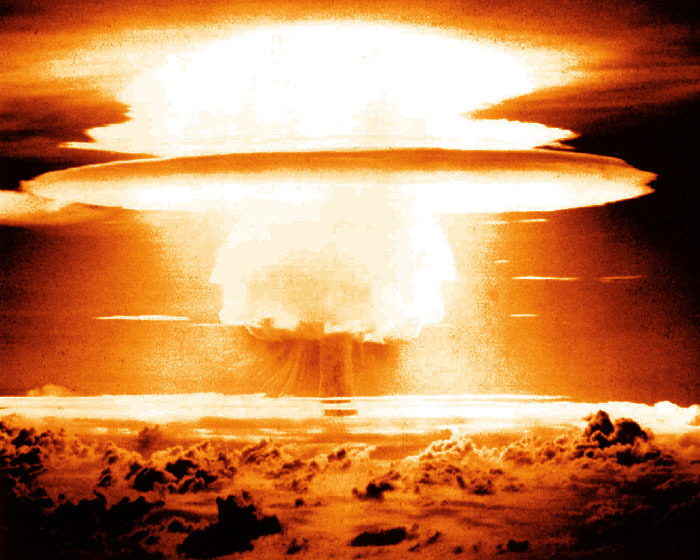 While the 1951 "George" shot proved that a large fission explosion could be used to ignite a small mass of thermonuclear fuel in a highly controlled experiment, scientists still grappled with the problem of how to configure a weaponized device that would produce sufficient energy from the exploding mass of fissile material into the thermonuclear fuel in order to achieve the temperature necessary to make it burn. While experimental physicists and engineers tackled that problem, theoretical physicists had already been hard at work thinking about the next step: the ignition of a large mass of thermonuclear fuel by a relatively small fission explosion. The breakthrough came in early March 1951 (two months before the planned tests at Eniwetok), when Edward Teller and Stanislaw Ulam came up with a promising design (the details of which are still highly classified). Calculations based on the new design commenced immediately, most of them done by Los Alamos scientists. In addition, scientists used some of the earliest computing machines to help with calculations. The new design idea and the calculations supporting it were presented to a wider group of scientists at a meeting held in Oppenheimer's office at the Institute for Advanced Study at Princeton in June 1951. Several members of the AEC and the GAC were also in attendance. Those present immediately concluded that the new design was technically sound and that it probably represented the best chance of succeeding in an experimental test. Shortly thereafter, plans were developed at Los Alamos and approved in Washington for a series of tests of devices that would verify this design. In the fall of 1951, it was decided that there should be two separate test operations. The first operation, IVY, was to be held as soon as possible and would include a number of tests to verify the Teller-Ulam design in a strictly experimental situation. The second operation, CASTLE, would come as soon as possible after IVY and would test the Teller-Ulam configuration in forms suitable for military use (i.e. weaponized devices). The first series of thermonuclear tests conducted by the United States took place in November 1952 during Operation IVY. The first test took place on November 1, 1952 on the small Pacific island of Elugelab at Enewetak Atoll in the Marshall Islands. The explosion, nicknamed the "Mike Shot", was very successful. It yielded an energy equivalent of 10 megatons of TNT, an amount roughly 1000 times as large as that released by the Hiroshima bomb (some 13 kilotons) that was dropped on Japan in August 1945. Though the test proved successful, the Mike device was very far from being a practical deliverable weapon. Its thermonuclear fuel consisted of liquid deuterium, a substance which must be cooled to temperatures colder than -250 C in order to liquefy it. As a result, the bomb required a complex refrigerating device (the size of a small laboratory) in order to maintain the fuel in that condition prior to its being exploded. One of the major reasons physicists decided to test the first thermonuclear device with liquid deuterium as its fuel was because it would be much easier for physicists to make theoretical calculations from the simple "burning" of deuterium compared to the complex multi-step process involved in the explosion of solid lithium deuteride (LiD). In addition, the United States did not at the time have a production plant capable of producing the high quantities of enriched lithium necessary for use in a thermonuclear device. The second device tested on November 16, 1952 during Operation IVY was known as the "King Shot". This device was dropped from an aircraft and exploded at an altitude of 1480 feet above its target. The explosion, which derived its energy entirely from fission, was extremely large and probably yielded somewhere around 500 kilotons (the actual yield was never officially released). According to President Dwight D. Eisenhower in a speech made a year after the IVY tests, the United States possessed an atomic bomb "25 times" the size of the ones used in Japan, meaning 500 kilotons. The King Shot was important because it demonstrated that developing thermonuclear weapons was not the only way to build extremely massive bombs. Ever since JOE-1, many politicians and physicists claimed that the only possible way for America to ensure its security was to produce a much bigger bomb than the Soviets had, and that the only way to do that was through a crash development program of the hydrogen bomb. Hans Bethe, in opposing the crash program for the super, suggested that a bigger bomb could readily be produced by a straightforward extrapolation of the current fission technology. In addition to the work being done on thermonuclear weapons, much of the research done at Los Alamos during the late 1940s investigated new methods to make more efficient, more powerful fission bombs. Some physicists explored ways to improve implosion techniques through experimental laboratory work. Others focused on using mathematical calculations to explore the possibilities of new configurations. By the early 1950s, scientists had determined that very efficient fission bombs in the megaton class could be developed by adopting the latest implosion techniques. The King Shot confirmed these ideas by producing an explosion yielding nearly half a megaton of TNT. Operation CASTLE was the second thermonuclear test series planned by the Atomic Energy Commission and took place in the spring of 1954. During CASTLE, six variants of the superbomb were tested. The first test in that series, the Bravo test, took place on March 1, 1954. Bravo was a device using Lithium Deuteride as its fuel and the explosion yielded 15 megatons, the largest bomb ever exploded by the United States. The bomb was in a form readily adaptable for delivery by an aircraft and was thus America's first weaponized hydrogen bomb. The Bravo test explosion yielded more than two and a half times what scientists had expected. The huge explosion released large quantities of radioactive debris into the atmosphere. This resulted in the exposure and contamination of the inhabitants of nearby atolls, as well as some servicemen and the crew of a Japanese fishing trawler ("The Lucky Dragon") which had gone unnoticed in the security zone around the blast. This incident pushed the danger of radioactive fallout from nuclear weapons clearly into the public mind. The United States has never tested a nuclear device bigger than Bravo. When one such more powerful device was proposed in the mid-1950s by the Livermore laboratory for inclusion in another test series, Eisenhower personally vetoed it on the grounds of its excessive power. Black and white footage of the Castle Bravo hydrogen bomb test, conducted at Bikini Atoll in the Marshall Islands on March 1, 1954. The explosion yielded 15 megatons, more than two and a half times what scientists had expected, making it the largest bomb ever exploded by the United States. Atomic Heritage Foundation, "Marshall Islands"
Atomic Heritage Foundation, "Castle Bravo"